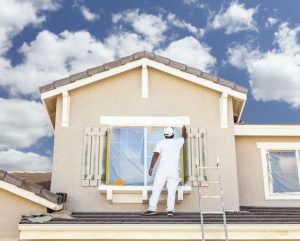 If you own a house in the Colorado area, you’ve probably already asked yourself how long you should wait before repainting it. While some people prefer to see visible signs of deterioration before they mobilize themselves, others take the more sensible route of researching when the paint work should be done and what type of paint they should use. In order to find out all this information, you have to be aware of the types of factors that can require faster paint work. The type of paint you use, the climate in your area and the grade of your paint will all help you determine when to start shopping for new painting tools and products. Weather conditions can seriously deteriorate the paint or siding you have on your home’s exterior walls. Strong winds and rain, as well as snow, widely fluctuating temperatures and intense sunlight can all become factors that gradually thin the paint and make its color and texture fade away with time. Generally, however, homes situated closer to the sea shore tend to fade more quickly than homes in climates such as the ones you’d find in Colorado. However, even here you’ll find that there are differing climates depending on where your home is located. Colorado homes located closer to the Rocky Mountains tend to be exposed to harsher winters and lower temperatures, as well as stronger storms. Here, the local climate can require you to repaint your home more frequently. Also, the temperature conditions can fluctuate quite rapidly throughout the state of Colorado, which generally influences local homeowners to look for more durable products that can last longer. The grade level and durability of your paint will also determine how often you should repaint your home. While some products only last a few years, others can last for decades without losing their original color. Oil based paints tend to suffer the most deterioration, while matte paints suffer more as a result of mildew. At the same time, glossy paints will make any small cracks more visible, so use extra care while buying them. The best course of action under these circumstances is to go with satin or acrylic latex paints. They can withstand damage from poor weather conditions more easily, and they’ll last much longer than other types of paint. Also, if you want your paint to last longer, make sure you use lighter colors, rather than darker ones. Dark colors fade more quickly, and can require more frequent repainting, especially if you use various high contrast patterns that make the deterioration more visible. All in all, you’ll find that most interior painting Highlands Ranch experts will tell you that there isn’t an exact date when you should consider repainting your home. Every type and batch of paint is different, and your home could have sustained more or less damage due to bad weather conditions, when compared to other homes in your area. So the best course of action in determining when to repaint your home is to use the information presented above to make up your own mind, and possibly ask for a second opinion from one of the dependable contractors in your local area. Copyright © 2018 americancraftsmancorp.com. All rights reserved.